Since 2009, Perth Tans has specialised in professional, natural and fast spray tans which don’t compromise on quality. 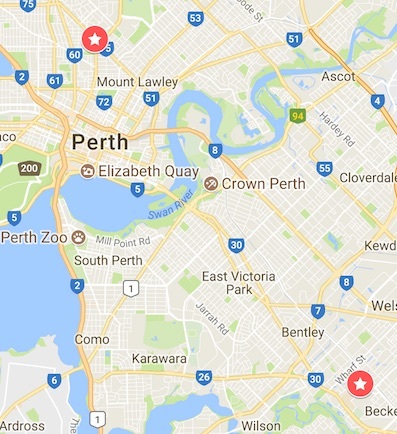 Centrally located in North Perth, just 3kms from the Perth CBD – we offer spray tan, eyelash extension, lash lift and professional hair and make-up appointments to our busy but discerning clients. We provide a solution to all of Perth’s tanning needs and skin types stocking Aviva, Naked Tan and Tuscan Tan Spray Tans in both an overnight and an express alternative. For information on eyelash extensions please see our Perth eyelash extensions pages. Re-branding and amalgomating from Perth Tans and Perth Lash Extrensions to Tan Lash & Beauty in 2016, our team has specialised in spray tanning Perth for a decade. The salon is equipped with state-of-the-art spray tan equipment imported from industry leaders in the USA which ensures client comfort with the latest in over-spray extraction technology. Our carefully chosen solutions are well known, established brands and we do not cut costs by offering cheaper, imitations with ingredients which may irritate or dry out your skin. BEWARE of inferior equipment not intended for spray tanning which will leave you with second rate results. You will not find a hair-dryer looking spray gun or a pop-up camping toilet tent here! We know that these days, there are products on the market intended for “DIY” spray tans. Let us assure you, you will not save money, time or your dignity. By the time you purchased the inferior machine that sounds like an air drill and has the power of a perfume bottle, purchased a bottle of spray tan small enough so it won’t cost you too much when it naturally expires 2 months later, found someone to spray tan your back without making you look one-half oompa loompa and gotten spray tan all over your bathroom – trust me you will wonder why you bothered. At our salon, your spray tan will be applied by a professional technician who will make you feel at ease, you will be in and out the door in ten minutes, we clean up the mess and you are left with a salon quality tan and not an obviously dodgy home job. Tan Lash & Beauty are specialist salons and are dually established as one of Perth’s leading Lash Salons, offering Classic, Hybrid, Russian Volume 3D-6D Extensions as well as the latest revolutionary Lash Lifting. Have you left a gift until the last minute? Or maybe you have a friend whose pasty white legs are blinding you and could benefit from a gentle nudge. Our gift vouchers for both spray tans and eyelash extensions are available to purchase immediately online and can be emailed or printed at home to go in a card. Click below to book your appointment online now or to purchase a gift voucher to be emailed instantly to you.